What a great weekend for the Styleness Waratahs! Winning 4/5 grades, along with a Women’s T20 win, and finally a Brewer Shield loss on the Sunday. It was always going to be a big round coming up against UTS North Sydney, which featured several ex-Waratah’s. First grades below par total of 225 was chased down by the Bears for the loss of 5 wickets, with 3 of those wickets all ex-Waratah’s (A Crosthwaite, J Crosthwaite, M Alexander). Second grade had a great win in their one-dayer, setting 8/266, UTS North Sydney never looked in it and were eventually bowled out for 156. Third grade had an absolute nail-biting 1 run win. We set 7/210 from our 50 overs and a wicket on the last ball from skipper Nick McLachlan ensured the Bears finished their 50 overs all out for 209. Fourth grade are back in the winners circle after a comprehensive win, bowling the Bears out for 150 and chasing it down for the loss of 3 wickets. Fifth grade had a huge win thanks to a debut grade hundred from Sam Jones to help his side set 6/226 from their allotted overs, which proved to be too much for North Sydney’s batsmen, who could only manage 8/151 from their 50 overs. The women’s T20 side had a comprehensive 20-run win on Saturday, with Kristie Crawford the star with another 51*. The Brewer Shield girls unfortunately were soundly beaten by Gordon on Sunday, Gordon set us 184 for victory but we could only manage 85, all out. Overall, a very successful weekend for the Tahs and it catapults us into fourth spot on the Club Championship ladder. Round 11 sees the Tahs face Sydney on Australia Day in a one-dayer. Young Sam Jones scored his debut hundred for the club at Tunks Park over the weekend in fifth grade’s dominant victory. Coming in under the pump at 1/0, Jonesy mixed finesse and power hitting to anchor the fifth grade innings to a total of 6/226, which proved far too much for the Bears. Jonesy has been plying his trade in the pathway system between Manly and Warringah and it’s great to see him go on to make 105 to look to cement his spot in fifth grade in their quest for the the finals to defend their premiership. Sam is currently a member of the Green Shield who finished the regular season as minor premiers, where he has scored 140 run @ 28. Congrats on your hundred Sammy! Hopefully the first of many for the Tahs. The Manly 1st grade boys arrived at a North Sydney Oval that was maybe not quite in its best form after a summer of Big Bash and moonlight cinema screenings. Greeted by a slightly tacky green wicket and a few familiar faces we lost the toss and were asked to have a bat. Faz and Logan negotiated a tricky few overs before the latter fell LBW. AB joined Faz and the pair batted with due caution, but also strong intent on anything loose. After the lunch break the boys continued where they left off before we lost both in quick succession AB for 49 and Faz for 36. Joel Foster looked his positive self before edging a wide one. Nappa (Not Dylan) batted beautifully for 46 and looked set for another big one before chopping on. Tim Doonan on return from a serious shoulder injury battled hard for 15 and each of the tail contributed either with runs or absorbing a large number of balls. Former Manly big unit and all round great man Matt Alexander was the pick of the bowlers with 4-24. All out for 225 with 15 overs left in the day we were excited for a crack at a few of our former top order sticks, knowing there was still some movement in the deck. J Cross opened up and looked good before he copped a seed of doom from Ryan Hadley and could only tickle it through to Doons. This brought A Cross to the crease. If you haven’t figured it out I still can’t spell their last name. Adam started well nailing a number of picturesque straight drives but Nappa had a cunning plan, he was fielding almost directly behind the umpire stopping every straight drive and not letting Adam get off to a flyer. Viss then did what Viss does and pitched one on off jagged it away got Adams edge and all of sudden two of the most dangerous sticks in the company were back in the sheds with 20 on the board. At the fall of Adam’s wicket we expected North’s captain Jagot to bat at number four, apparently he didn’t fancy it and out strolled Matt Alexander. We were all well aware of Matttos’ six hitting ability but what of his forward defence? First ball blazing cover drive for 4 second ball leave, third ball edge through to Doons. Hads and Matt then traded some friendly regards before the former made his way off the ground. We were unlucky to not have four back in the sheds by the close with a close LBW turned down. We started day 2 with Norths 3-30 we bowled the best we have all year but couldn’t get a breakthrough! Hads and Viss had a good 10 play and misses off there bowling in the first hour alone. Unfortunately it didn’t really pick up for us from here despite a few late wickets and Norths passed us 5 down. The 50/50s didn’t quite go our way as well as a few dropped catches that cost us the game. The boys played at home against our cross town rivals North Sydney with the opposition winning the toss and sending us into bat. Ned Hole (30) and Max Webber (33) got us off to a solid start which allowed Tom Kaye (72) and Skipper Sam Gainsford (46) to put on a 95 run partnership for the 4th wicket. The innings was finished off with some explosive batting from Jake Carden (25) and Andrew Jamieson (40) to get us to 8/266 of the 50 overs. Andrew Jamieson (2/30) and Tom Kaye (1/16) opened the bowling before Brad Wilson taking his first 2nd grade wicket (1/14). Andrew Hicks (2/25) and Hamish Starr (1/21) also claiming wickets before Max Webber burgles (3/16) at the end to Norths out for 156 to claim a comfortable victory and a bonus point. This wins sees us win 4 on the trot after a slow start to the year. The third grade boys rocked up to North Sydney Oval No. 2 eager to keep their winning momentum going and push ourselves up the ladder. We lost the toss and were sent in on a good cricket wicket with a lush outfield. Sam Hole and Matty B once again put on an opening partnership clinic, putting the bad balls away and rotating the strike with class before both lost their wickets. Zach and Dom went about continuing the momentum, both looking comfortable and at 2-140 off 30 we were looking set to hit 250+ with wickets in the shed. However the loss of Zach halted our momentum and we continued to lose wickets. Dom, with such leisure, batted his way to 61 before we looked for quick runs. A few late cameos from Akhurst, Sommerville and McLachlan took us over 200 as we finished our 50 overs on 7-210, probably leaving 20-30 runs out there. We knew if we bowled straight and full we’d tear apart the wounded bears outfit. RBP and Counsell opened up the attack, with one or two balls an over costing us a boundary, before RBP got the break through. Bain came onto the attack and grabbed two in quick succession to have the Bears 3-50. A partnership began to grow with poor fielding being our downfall, as the Bears ticked their way to 3-140 before Sommers knocked the middle stump out of the ground. 4-140 after 35. At this point we knew we could tighten the screws and if we stuck to our plans we’d win the game. However the combination of lack lustre fielding and not sticking to plans left the door open for the Bears. Requiring a run a ball and wickets in the shed, the Bears edged their way closer to our tally. At 6-155 off 43 the game was in the balance. Nickos, Counsell and RBP were trusted to bowl the final few overs and executed their plans superbly, however they weren’t backed up in the field. 18 runs needed, 2 overs left and with 3 wickets in hand. Sloppy fielding and a couple of dropped catches resulted in the Bears requiring 7 off the last over to take home the points. Enter Nick McLachlan. A couple of 2s and dot balls resulted in the Bears requiring 3 off 2 balls. Nickos beat the bat however they snuck through for one on Matty’s keepers arm and as the ball went all the way through to mid off they tried to sneak a second run, however Zachy T calmly ran out their number 10. Last ball of the game, 2 runs to win, 1 run to tie, 1 wicket in hand. A bouncer was bowled and a miscued pull shot went straight up in the air to Dom, who was on the ring at short third man and took a simple catch. The Tahs get up by 1 run in what can only be described as a game where poor fielding almost cost us 6 points. The Tahs now sit tied on 32 points in 7th place and will look to keep moving up the ladder next weekend against Sydney. Round 10 saw the mighty 4s home against the bears in a round where there was plenty of motivation from both teams to succeed. The deck was green and hard, and when captain Adam Gummer was afforded the choice to bat or bowl at the toss, the bears found themselves warming up with the willow.We knew to be wary of this somewhat struggling bears outfit, but an early breakthrough on the 3rd ball of proceedings from Josh Wigney had the Tahs immediately on top.The Bears crawled through the first power play going at barely 3 an over before the second breakthrough was had, the number 3 coming and going without providing any excitement for anyone, undone by starvation of the strike and some Jimmy C magic with the ball. The team was pumped, the mood was high —and despite a couple of lackadaisical efforts in the field but we knew that if we were able to get a couple more wickets quickly we could be chasing well under 100.A few overs and a bowling change later we had our 4th to Jakey Osbourne courtesy of a cut-shot so poorly thought out and executed, off stump was firmly pegged back. Unfortunately the second quick one we were after didn’t eventuate, the opening batter from Norths managing to find grass on some less than convincing lofted drives and the number 5 providing some sound support, the score passing 100. The little partnership was finally broken with Jimmy Crombie announcing his presence in the field in spectacular fashion with a trademark diving effort at cover to help dismiss the opener off the bowling of Jacob ‘Yak’ Graham in the 23rd. 4-130From there the screws started tightening. A few streaky boundaries from the number 5, turned into delight again for the tahs, the North’s middle order bat ignoring advice from the batting coach about cover driving through the line. His pass to drink with the Bradmanesque like Crosthwaithe likely to be revoked on Tuesday. Crombie finding himself in the thick of it, diving low to his right to give Yak his second. Seizing the moment Adam made an inspired bowing change, taking off Osbourne who’d been tying up an end and brought back into the attack Jimmy, who with Graham bustled their way through the lower order taking 3 a piece and causing havoc over the course of their 10 over partnership to leave the bears reeling at 8-150. At one point taking 3-0 between the 38th and 42nd overs. Enter the Dr. Andrew Rochford himself. The great man finding his length to make number 10 and 11 look like right fools, finishing the Bears innings with his 5th and 6th ball of his returning over. Completing a stunning collapse of 6-22 from the lower graders.If you need to find Dr Roch over the next 6 days he will be likely found in front of any reflective surface available rehearsing his hat-trick celebration for ball one Rd 11. Tune in to channel 10 this Friday evening to hear from the great man himself about how he’s just does a little bit either way with the ball. Just as he did for the rest of Saturday, I’ll reiterate; the Doc is on a hattrick. The other side of the lunch break saw Cohen and Gummer tear to pieces any glimmer of hope the wounded bears had of seeing any points from this game, Cohen carving out boundaries at will, and Gummer being the great nurdler that he is behind point and square. For god sake don’t get on that man’s pads.Finally some joy for the men in black and red as they finally managed to hold a catch and then finding another scalp shortly after, Gummer and Osbourne the victims of some late in the day demons in the pitch starting to play a part. However this joy was short lived as Cohen went on his merry way, batting well with Crombie and taking the game well away from the Bears. Unfortunately ‘Slothy’ Cohen’s blistering innings came to an end on 47 as some demons of his own convinced him to run past the leggie. With Jimmy C looking imperious, and Lachlan Charles showing some exceptional touch the rest of the game was merely a formality, both ending with red ink on 40 and 19 respectively. Special mention to returning star recruit Billy D’arcy who enjoyed his meteoric rise back up the grades with a holiday in the heads of the opposition batsmen during the morning session. With a solid score on the board, the boys knew that they had to bowl and field well to secure the win. Openers Hobson and centurion Jones bowled tight areas without much luck until the opener top edged a short ball into his face without a helmet on. Going off due to a split lip, the bears where hypothetically 1 down and that’s were the manly boys started the rot. Jordan Brewster bowled at his hustling and bustling best to snare the other opener and came back later to grab another two. Young Lachlan Trewartha bowled with great skill and control to snare one himself. Captain Marshall snared his usual 3fa, with all three poles being beautifully identical off-breaks that spun back through the gate to take the top of off stump. The tight bowling and fielding left norths significantly behind the required run rate, resulting in them blocking out the rest of the overs with no avail, coming 75 runs short of the target. 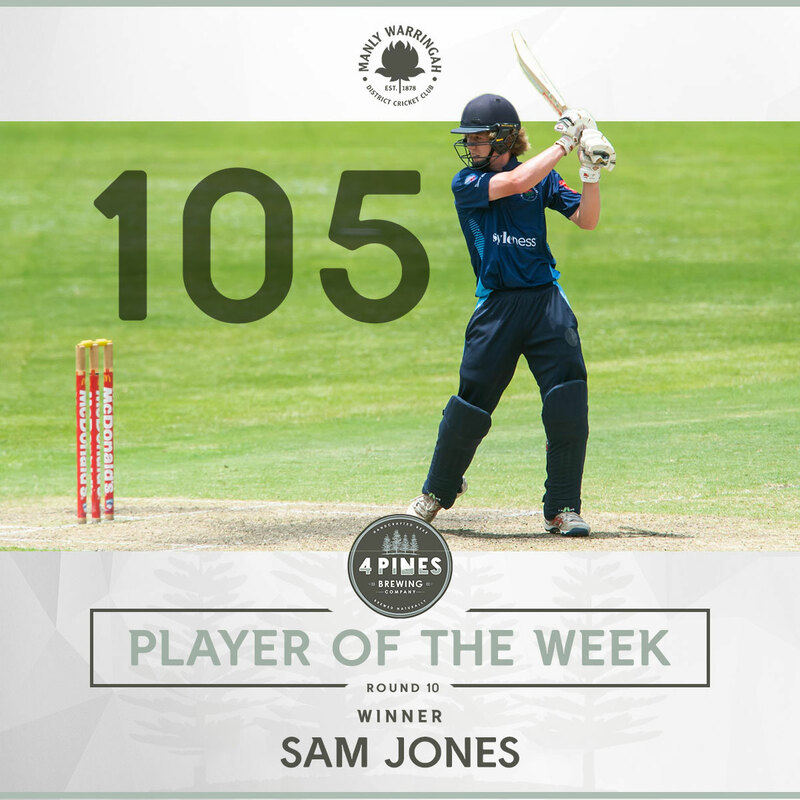 A great win from the manly boys with a fantastic team effort, but the star of the day was Sam Jones with a fantastic debut ton. Rounds 3 and 4 in the T20 comp found Manly travelling out to Bankstown. First game we lost the toss and bowled first. Sarah picked up a wicket first ball and bowled well in partnership with Jess Mulcahy who was playing her first 3rd grade game. Bankstown consolidated however putting on a solid partnership with the next two batters both retiring on 30 and 31. But the new batters were not able to keep up the pace and the next wicket fell at 83 with a good catch to Sarah Gordon off the bowling of Kristie Crawford. Jess came back for the second last over and bowled a double wicket maiden one of them another sharp catch to Sarah who then backed up to bowl a maiden in the last over. Mia Waddington and Olivia Hough combined to get a run out at the end and Bankstown finished 5/97. Our chase didn’t start well with Mia, Nat Guyot and Olivia all falling cheaply. Kristie and Jess came together to build a strong partnership. Jess then retired with 31 of 24 balls. Sienna came in a smashed a couple of boundaries but was then caught. Gemma Lacey then combined with Kristie to bring us home. Kristie retired 30 off 32 balls and then Gemma, Issy Keene and Claire Waddington had some fun batting out the overs to maximise bonus points. We won the toss in the second game and elected to bat, again we didn’t get off to a great start. This time it was Nat, Renee Hough and Sarah all falling to Bankstown’s strong opening bowling attack. This brought Kristie to the crease however, who was a hurry to lift the run-rate. Another mini collapse saw Alecia Humphrey, Mia and Jess back in the sheds. Sienna James joined Kristie to smash 21 of 15 balls. Kristie retired before cameos from Claire, Gemma and Olivia kept the scoreboard ticing over. Kristie then came back in to continue where she left off and bring up 51 not out off 29 balls. Defending a score of 122, everyone bowled well and the Bankstown batters were never able to achieve the run rate required. Two wickets to Gemma and Kristie and one to Issy, Jess and Renee. Nat and Olivia also kept well to assist with two run outs. Bankstown finishing 8/102 after 20 over. The Brewers girls travelled out to Killara to commence their 40 over game against Gordon. We lost the toss on a wet outfield and were asked to bowl first. Laura Judson and Jasmin Wilson opened the bowling and limited the opening batters runs, setting a good standard for the rest to follow. Ellie James and Gemma Lacey then came onto the attack, with Ellie bowling a maiden and Gemma continuing to restrict Gordon runs. The tight bowling was sustained through Sienna James and Jess Mulcahy’s bowling, with the opening batters taking very few risks. Gordon then struggled to our spinners Abby Melville and Mia Nel, who both bowled their max overs. In the rush to get quick runs at the end we took three wickets, all of which were run outs by Jasmin, Mia N, and Jess. Gordon finished 3-183 off 40 overs. Gordon are a class side and our performance with the bat was a little below par but looking forward to getting back to Manly Oval next week.